The Jaguar is the third largest feline after tigers and lions and the largest big cat in South America. The Jaguar is characterised by their tan/yellow coat with distinctive dark brown and black spots dubbed “rosettes” due to their rose like appearance. Distinguishing between Jaguars and Leopards can be tricky. However, what differentiates them, are the small spots inside their rosettes. Solitary animals, jaguars hunt and live alone. The Jaguar is a strong swimmer and climber making them exceptional hunters. Their powerful jaw and sharp teeth allow for them to kill their prey with a single bite through the animal’s skull. Not very fussy, jaguars eat deer, snakes, crocodiles, monkeys – essentially anything they can catch. What sets them apart from other cats? Jaguars can swim. Unlike every other cat, jaguars aren’t afraid of water; in fact they love it and do a lot of their hunting in it. They’re very strong swimmers and are excellent at catching fish, frogs and other marine life. Jaguars were once very abundant across the Americas but their population has been rapidly decreasing. Whilst their population isn’t regarded as endangered or nearing extinction, the population trends indicate this is a real possibility. Back in the 1950’s and 60’s, poaching was the biggest threat. During this period, there were over 15,000 jaguar skins being sold each year in Brazil alone. The trade for not only the fur of jaguars but also their bones and other body parts has continued to the present. However, there has been a persistent effort to reduce poaching with anti poaching laws now in place. 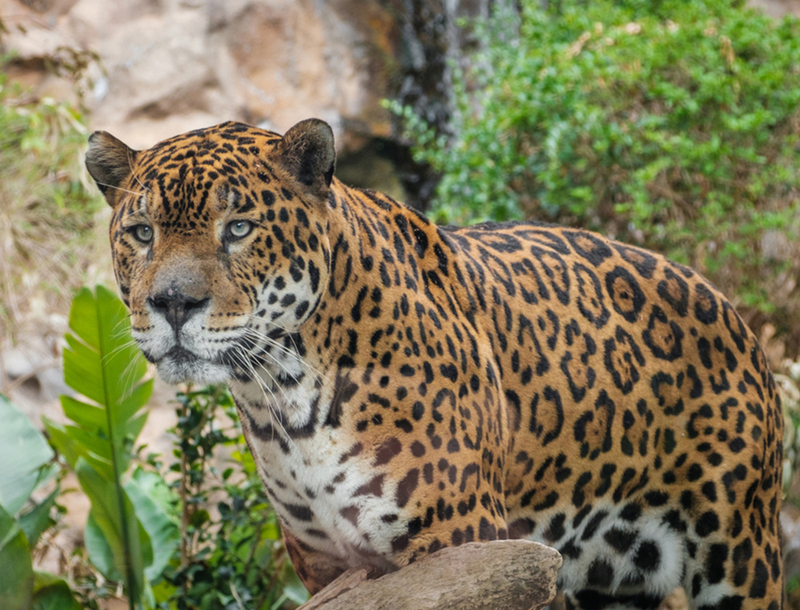 The biggest threat to jaguars at the moment is deforestation. Land clearing for agriculture, mining, and residential areas has resulted in a drastic loss of habitat. This has also impacted their migration routes preventing jaguars from travelling between areas, making their habitat smaller and smaller. In the late nineties, the jaguar was granted full protection under the Endangered Species Act. In 2016, the U.S Fish and Wildlife Service released a draft jaguar recovery plan. The action taken to protect this precious species, is progress. However, the real difference will be made when governments put a stop to deforestation, particularly in the Amazon Basin.